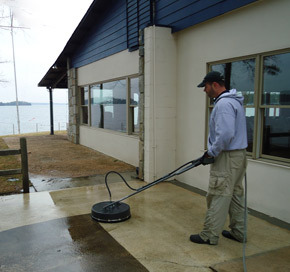 Having a pressure washing service is an important part of your building's exterior maintenance. Keeping your sidewalks, parking lot, and building façade clean helps present a professional appearance for your customers and prolongs the life of your property. Our 400 psi equipment can handle anything from a front sidewalk to an entire 15 story concrete building. Our courteous staff will take special care to not damage your property with our high pressure equipment and as always our pricing is competitive. As with any other service that we offer, we stand by our work and have a 100% satisfaction guarantee. Contact an ABI representative today to schedule a site visit for your pressure cleaning needs.